Which of the following two statements is a goal? (1) Clean out and organize the garage. How you answer the question says a lot about how you do life. In my experience, somewhere around 60-65 percent of people will say that (1) is a goal, whereas (2) merely expresses an aspiration. For these people, a “goal” is a hard target to aim for. Anything less than that is just a good intention. By that measure, cleaning up a garage qualifies as a goal. It’s specific (you can pinpoint what, why, who, where, and which). You can measure whether it’s happened. It’s easily attainable, or doable. It’s relevant in that it matters (maybe to your spouse, even if not to you). And it’s timely in that you can attach a date to it. However, wanting to develop more patience would not qualify as a S.M.A.R.T. goal, because it’s too undefined, is not easily measured, is questionable in terms of how attainable it might be, and cannot be put on a schedule. About the only thing it may have going for it is that it’s probably relevant (especially if you’re an impatient person). That’s how goal-oriented people see things, anyway. The other 35-40 percent of people will say that both statements above are goals. 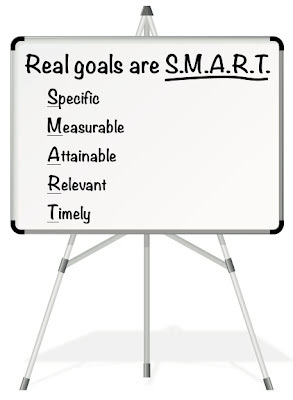 In fact, there are many people whose goals are mostly like 2, and not at all like 1. So who’s right? The answer is—both! Because it turns out that both kinds of people pursue goals. They just pursue very different “goals,” and do so in very different ways. If you understand how this works, it will save you and others lots of trouble, especially when you’re dealing with Someone Who Is Not Like You. But then I draw another diagram. It’s meant to show how the other 35-40 percent of people do life. 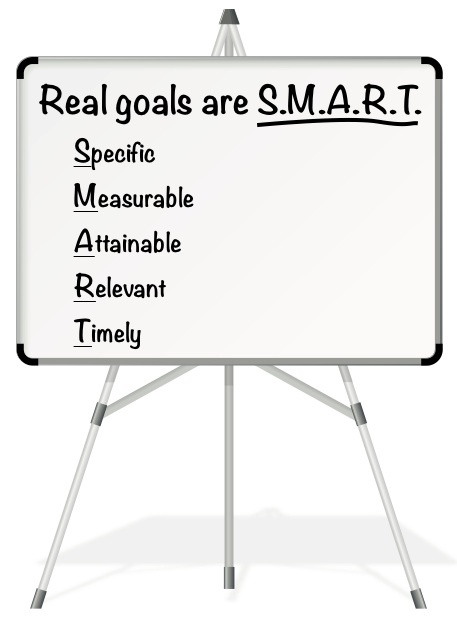 They don’t do life by goals—at least, not the sort of S.M.A.R.T. goals that goal-oriented people pursue. They do life by. . .well, what we might call a vision. That is, a picture in their mind. It could be a picture of a concept. Or of a relationship. Or of an ideal. Or of a cause. The point is, they see a vision that looks interesting. And they go explore that vision for a while. Let’s say their vision is the concept of Native American lore. So they buy books about that. They go online and look up websites about it. They start downloading music that expresses NA culture. Maybe they even go to a pow-wow or spend a weekend at a sweat lodge in order to have the authentic NA experience. They really “get into” the whole concept of Native Americans. But then one day something interesting happens. A new concept comes along. They start to dabble in it. Before long that new interest has supplanted their focus on Native American lore. Now their time and energy is devoted to, say, nature and the environment. They join the Sierra Club. They buy books on energy usage. They get into recycling. They start biking to work. You get the picture. They hang out with the concept of nature and the environment for a while. But then once again, another concept comes along and starts grabbing their attention. Say, photography. They really start getting into photography. But eventually that kind of run its course, so they take up blogging. They really get into blogging. Then one day, yet another concept piques their curiosity, and they start to move toward that. But before they get there, another concept that has even greater appeal pops up, and they veer off and go explore that. In Part II (next post), I’ll talk more about how these differing styles can get along, despite their conflicting perceptions about “goals.” What we’ll see is how much each style needs the other. For now, just consider this: contrary to popular opinion, not everyone in the world is goal-oriented. Not in terms of hard-target, S.M.A.R.T. goals. And it’s pointless for anyone to say, “Well they should be!” Because they aren’t and they won’t be. You’re never going to take an inherently vision-oriented person and “turn them into” a goal-oriented person. 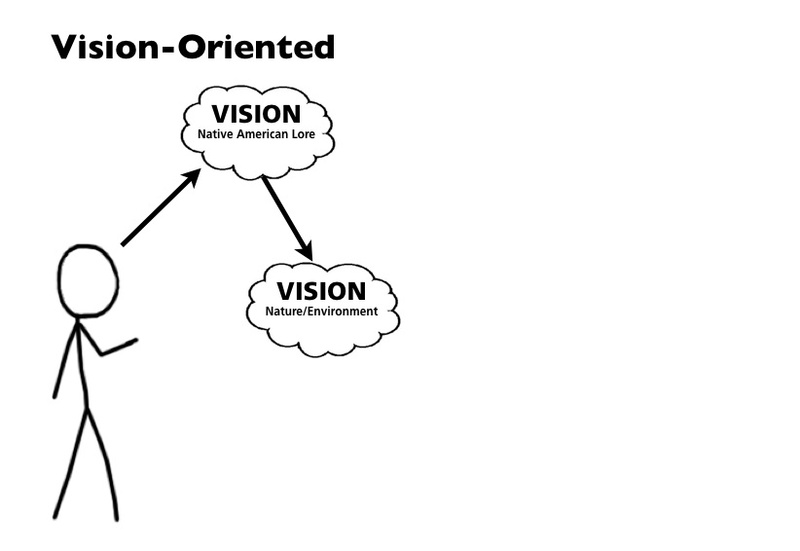 That vision-orientation is a part of their hard-wiring. What we call their giftedness. You can never change a person’s giftedness. Nor do you want to. Because a person’s giftedness is the wellspring of what makes them who they are, as well as how they were meant to contribute to the world. Change that, and you would literally obliterate the person and turn them into your own little creation. Thank God, the power to do that is not given to humans (though sadly, many try). The better path is to accept people for who they are. Is your natural bent toward setting goals? Great! Plan your work and work your plan. Or is your makeup more vision-oriented? Great! Dream, explore, create, and relate. It’s a big world with lots to be done. You can help by knowing what you were designed to do, and doing it. But as you do, beware of criticizing others who literally see the world differently. 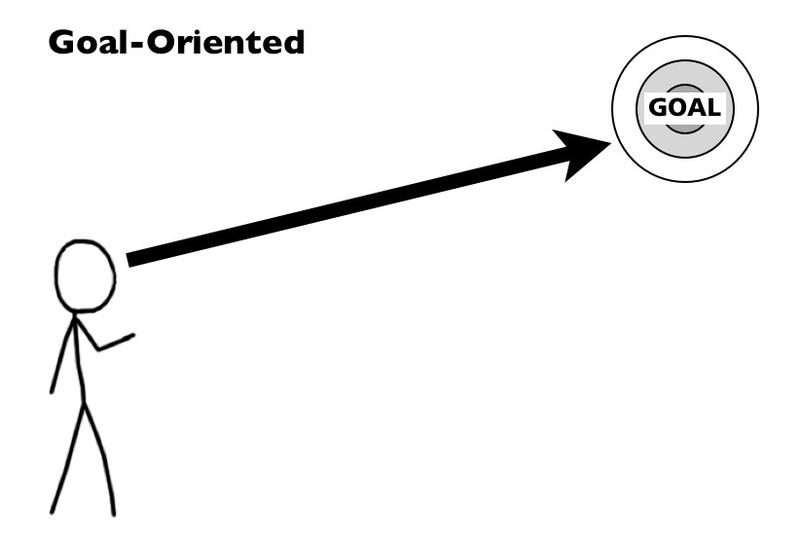 POINT OF CLARIFICATION: I know I’m making it appear as if everyone is either “goal-oriented” or vision-oriented.” But that’s just a broad generality. The truth is, everyone is unique. Perhaps a more precise way to see things is that people’s orientation varies along a spectrum between hard-target goals at the one end, and “softer,” more visionary/conceptual intentions at the other end. Thus some people are highly inclined to do life by S.M.A.R.T. goals, some incline toward visionary goals, and some are comfortable with both. Question: In the main, would you say you are more goal-oriented or vision-oriented? What does your history of achievement show? Question: Think of Someone Who Is Not Like You in that they do goals very differently than you. What happens when you interact with them? I know that you are painting with a broad brush here to keep the message simple, but please indulge my metaphor below. It is not meant to debunk anything you have written above!! Imagine a bridge, which in its most simple form, is made up of two planes: the horizontal "business end" which is walked or driven across (called a "live load" in the road building business), and the pilings or suspension beams that prop up the business end, which stabilize, support and distribute the weight evenly. 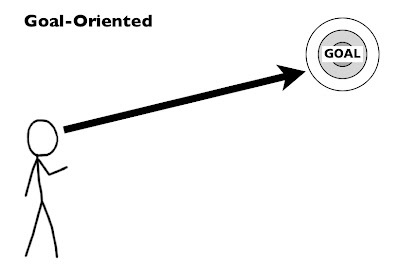 The "live load" plane represents the goal orientation. The pilings or beams represent the visions, which support and sustain us on our path. These component parts have a symbiotic relationship. A live load bridge surface without support would instantly be a pile of rubble in the river or valley below. The support beams, when installed without the bridge surface above, would make for a very peculiar piece of concrete and steel art with no function. Having worked with many incredible teachers and coaches through the years, your two paths categorize them very easily. As a good student, I have desperately tried to emulate both approaches on my path towards "success." Each time, I ended up with a sore forehead from running repeatedly into a brick wall! If I put on blinders and focused only on the task at hand, I ended up feeling exhausted and unfulfilled. If I drew from too many outside sources for motivation, I found myself overstimulated and unable to focus. By combining both approaches into a fully functioning bridge, I am able to (at least in theory) sustain myself through the goal achievement with less burnout and frustration. Thanks for the great insight, and keep em coming! You are right, I am speaking with a broad brush, since everyone is unique. But I love you metaphor. You will be intrigued, I think, by Part II in the next post, where among the things I'll talk about is how goal-oriented and vision-oriented people do need each another because each supplies strengths that the other lacks. It's interesting, in many of the organizations I work with, the bridge metaphor works perfectly, except the two planes are reversed: it is the visionary, entrepreneur, or creative person who is the "main show" in the enterprise, so to speak (the "live load"), but to get anywhere they require a supporting cast of "practical" (goal-oriented) people who have a bias for action and a giftedness around execution (i.e., getting stuff done). I wonder if my vision orientation is causing me to dislike a job role that I have historically been good at. I find myself very un-motivated at it now. I am a goal-oriented person. I like knowing/being given a direction and have upper management be VERY clear about what they would like the results to be. 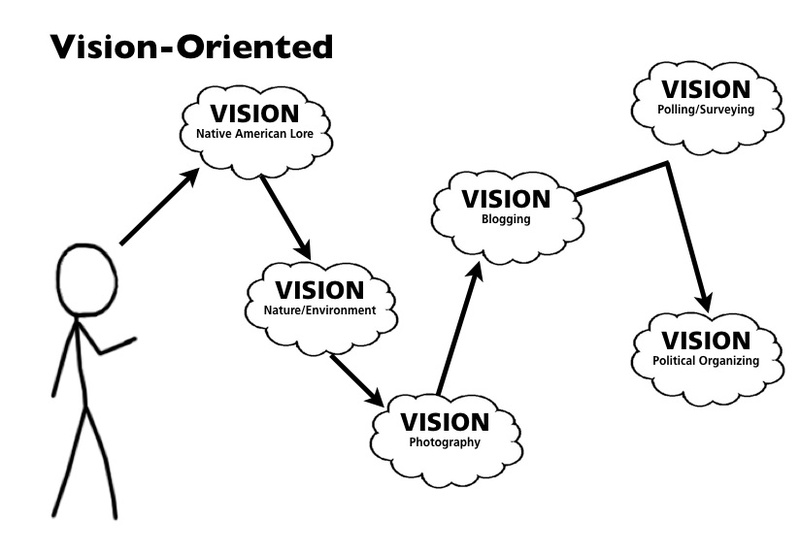 But right now because I have no focus I am acting like the vision-oriented person but I don't like it. I am 'existing'....going through the motions...not a good feeling for me. Omgosh! This brought tears to my eyes! I always felt as tho I will never know what I am meant to do bc I have all these things that run thru my head and get bored with them or move onto the next idea. To know this is part of my "giftedness" was a comfort. Wow thank you,I def know I am ordering the book now! Looking fwd to figuring some things out. I am 56 yrs old and have no idea what I am meant to do. The relation between family’s interdependence, school, and community culture are the main social factors, have a glimpse at this link to find more. Thanks for this. I came to a realization last night, at 67 years of age, that I was really not goal oriented. I was participating in a live theater event that took the form of a sort of social "game". It was enjoyable, but I began to reflect on the fact that the game had a "goal" of sorts, which led me to realize that all games do. For the most part I don't play games. Each has a definable goal and players compete to reach it. I always become bored at the prospect of goal seeking. I may enjoy parts of the process, but the goal does not attract me. I decided I was not a goal oriented person, and had never heard the other side of things spelled out. 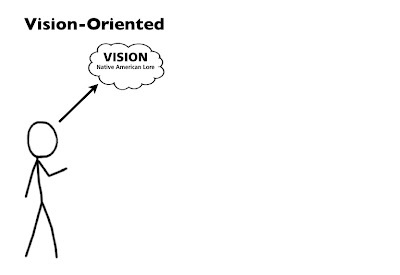 Looking at your "vision" person, I realize that is exactly me. It has always been obvious that I lacked ambition, as such, I just enjoy doing stuff, but becoming proficient does not interest me. If I enjoy what I'm doing, I will keep doing it, but thoughts of some goal don't enter into it. Other than the immediate goal, that is. To build a box, to draw a picture.